If you’re looking to get someone a gift, but that person seems to “have everything,” here’s something they might not have… yet: stained glass windows in their home. Talk about an elegant and memorable gift– stained glass windows are something people admire and talk about for years. Whether it’s a gift or something you treat yourself to, know this: stained glass adds a touch of elegance to a home. Most people would say stained glass improves the look of the place, and that’s quite true. No wonder, then, that royalty, churches, and castles are all associated with stained glass– it’s the kind of thing that makes a place unique, beautiful, and rich-looking. What’s not to like? How can stained glass improve a home today? Well, those with good taste know that stained glass is very good for interior design style. A large variety of modern glass pieces are available, such that even contemporary-plan homes can get away with the stained glass look and people will ooh and aah. Stained glass is all about catching the eye. You want your glass to make a visual statement; you want it to stand out and cause people to look. 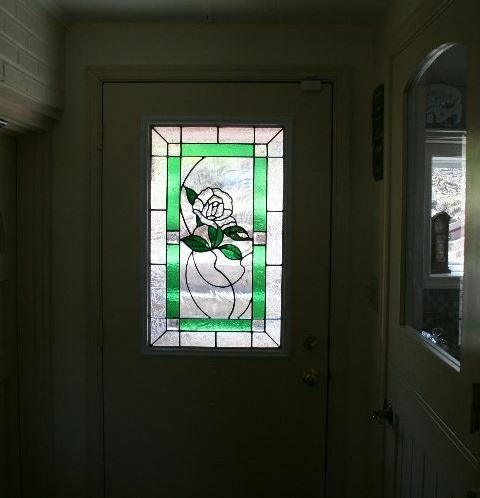 Where are some spots that could benefit from stained glass in the home? How about around an entryway door as a transom window? Or maybe in the bathroom as a privacy window? If you’ve got a window near the staircase landing, that’s a perfect place for stained glass to stand out and make a statement. Finally, if you really want to walk on the wild side, use stained glass for your skylight in a sunroom or indoor porch– how gloriously marvelous. Do you want to go for a modern approach? Then use geometric patterns like stained glass diamonds or squares for a contemporary look. Want to keep it simple-yet-elegant? Keep it clear or etched, perhaps with some gray accents– classy. Want some professional advice on what kind of stained glass could really jazz up the look of your particular home? Contact Cumberland Stained Glass at 717-691-8290. Keep in mind that every home is different, so it’s a good idea to consult with a professional to figure out what works best for the color scheme, architectural style, etc.